This week we have been thinking about how students can stay healthy during high-stress study periods. 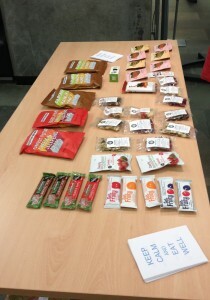 Most people opt for comfort food when they are stressed, something we catered for last week by handing out chocolate. While a little chocolate is fine occasionally, it is not the best thing to eat while studying! 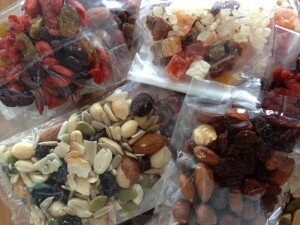 That’s why we have been handing out some healthier snacks this week. Healthy sugars, such as those found in fruit and vegetables, and protein provide more long-lasting energy and are much better for our brains. 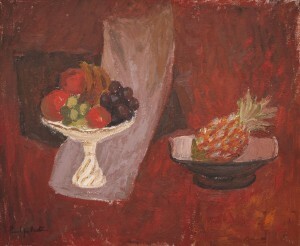 Fruit (Still Life) by Penelope Beaton. © The University of Edinburgh. Find it here. Take care of yourself this week! Remember, your library loves you! This entry was posted in Collections, Interns, Library and tagged happylibrary on March 30, 2016 by universitycollectionsvolunteers. 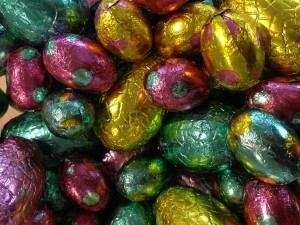 Today we continued our campaign to spread Library Love by handing out Easter Eggs in the Main Library Foyer. Many students are currently facing a lot of deadlines, so we want to show them that the Library cares about them with this popular comfort food! These statistics suggest that the people in the UK ate more chocolate than anywhere else in the world in 2011, with each person consuming 11kg on average! 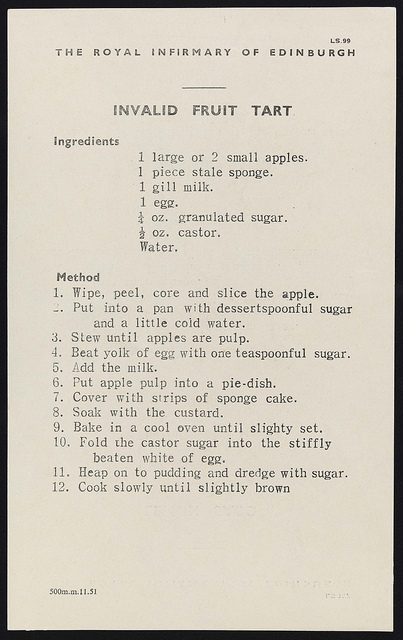 Invalid fruit tart recipe, Royal Infirmary of Edinburgh School of Dietetics, c.1950. (LHSA Ref: LHB1/89/4/1). Find it here. Follow us on Facebook and Twitter to find out more about our brain-boosting snacks, and other ways we are encouraging students to relax! Have a great Easter break! This entry was posted in Collections, Interns, Library, Uncategorized and tagged happylibrary on March 23, 2016 by universitycollectionsvolunteers. 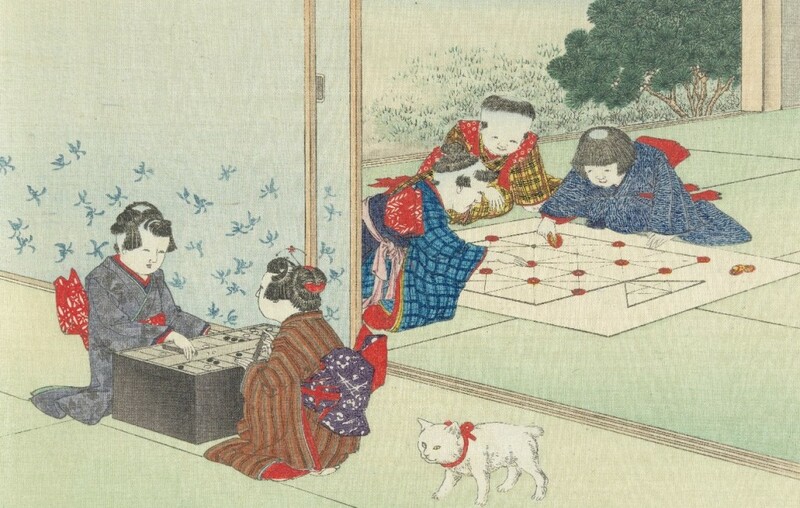 Eitaku Kobayashi, Children’s Games, 1894. RB.FF.63. © The University of Edinburgh. http://bit.ly/1QXWcJV. Today we have been handing out these puzzles in the Foyer of the Main Library! Why not take a break and try it? 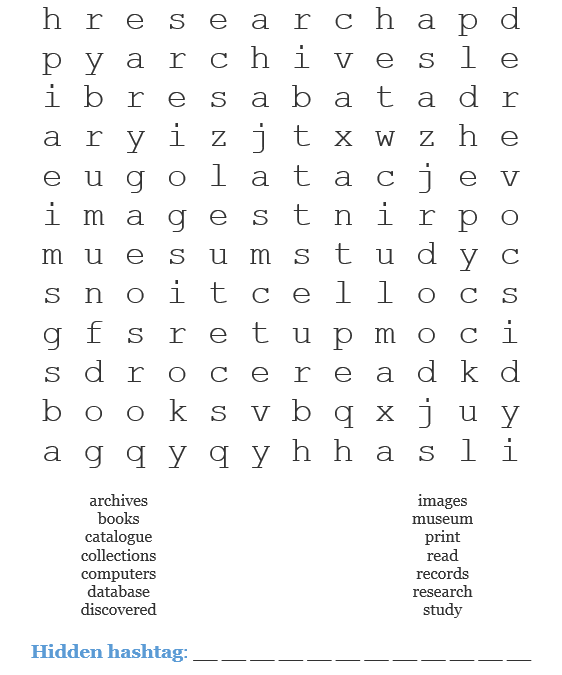 Find all the library-related words (words can be written forwards or backwards, placed horizontally, vertically, or diagonally), then take the first twelve un-used letters to uncover a hidden hashtag. Remember to tweet or facebook us when you find it! This entry was posted in Collections, Interns, Library and tagged happylibrary on March 16, 2016 by universitycollectionsvolunteers. Louisa May Alcott, Little Women, PS1017.L5 Alc. Margaret Atwood, The Handmaid’s Tale, PR9199.3.A8 Atw. Jane Austen, Pride and Prejudice, PR4034.P7 Aus. Charlotte Brontë, Jane Eyre, PR4167 Bro. Emily Brontë, Wuthering Heights, PR4172.W7 Bro. Agatha Christie, The Murder of Roger Ackroyd, PR6005.H66 Chr. Louise Erdrich, The Round House, PS3555.R42 Erd. Helen Fielding, Bridget Jones’s Diary, PR6056.I4588 Fie. Sue Monk Kidd, The Secret Life of Bees, PS3611.I44 Kid. Harper Lee, To Kill a Mockingbird, PS3562.E353 Lee. Audrey Niffenegger, The Time Traveler’s Wife, PS3564.I362 Nif. Sylvia Plath, The Bell Jar, PS3566.L27 Pla. Anne Rice, Interview with the Vampire, PS3568.I265 Ric. Mary Shelley, Frankenstein, PR5397.F7 She. Kathryn Stockett, The Help, PS3619.T636 Sto. Alice Walker, The Colour Purple, PS3573.A425 Wal. Virginia Woolf, A Room of One’s Own, PR6045.O72 Woo. Today we were in the Foyer of the Main Library asking students to vote on their favourite one! 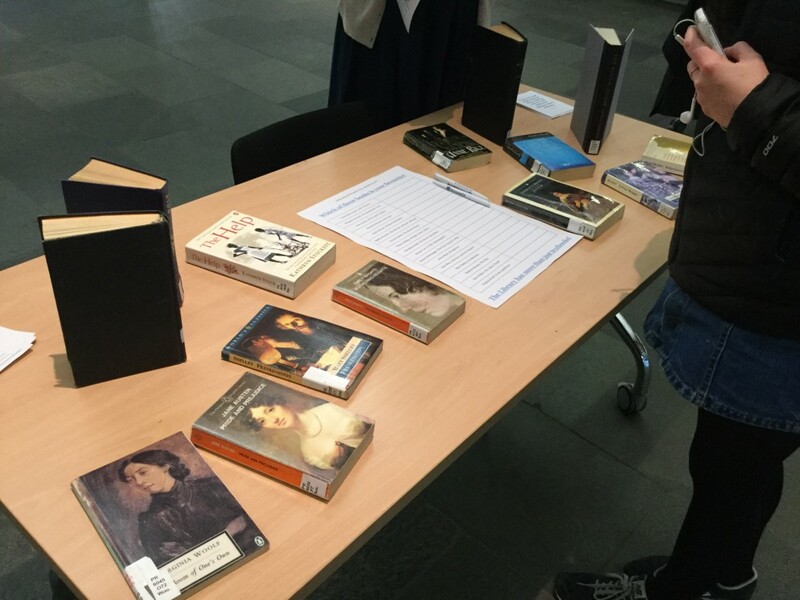 It was a close race, but in the end the winner was Charlotte Brontë’s Jane Eyre! Other popular titles were Pride and Prejudice and Frankenstein! Let us know on Facebook or Twitter (#happylibrary) if you have comments on the winners or suggestions of other titles! And why not borrow one of these books this week! Remember, it only takes six minutes of quiet reading to relax you. 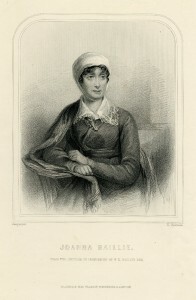 Steel engraved portrait of Joanna Baillie by H. Robinson after a painting by Masquerier. 1876-1877. Corson P.2021. Image can be accessed here. This entry was posted in Collections, Interns, Library and tagged happylibrary on March 9, 2016 by universitycollectionsvolunteers. 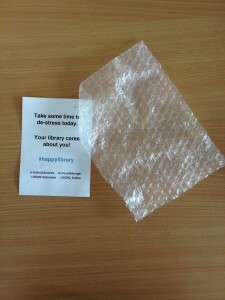 For the last few weeks, we have been running small events, designed to help students relax, in the Main Library Foyer. This article suggests that as little as six minutes of quiet reading is enough to reduce stress by two thirds! 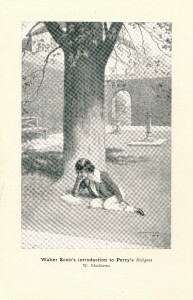 Facsimile of a portrait of Sir Walter Scott as a child reading in a garden, by W. Matthews, in Walter Scott’s Introduction to Percy’s Reliques, 1915 (Corson P.3448). http://bit.ly/1Qms4aC. While lots of quiet reading goes on in this library, it is usually not very relaxing. That is why we have been trying to branch out to students with short six-minute distractions (other than reading) so that they can be more effective, and feel happier, while they are in the Library. If you missed out, never fear; you can pop bubble wrap online here! So satisfying! As twentieth-century journalist Sydney J. Harris said, “the time to relax is when you don’t have time for it.” So, take some time to relax today and keep an eye out for our next fun pop up activity. This entry was posted in Collections, Interns, Library and tagged happylibrary on March 2, 2016 by universitycollectionsvolunteers.